Hot tub’s are just places where bad decisions are made. It wasn’t “Swimming Pool Time Machine” or “Couch Time Machine”. They knew what they were doing. Hot tubs are their own kind of transport, rife with half-baked schemes, incomplete epiphanies, insincere flattering and unreasonable promises (and usually a fuzzy enough memory to never learn). Late at night, sipping something strong and looking at the stars, more things are possible. Like running, for instance. “I swear,” you say in a staccato mash of words. “I’ll be up at 6am to run that 10k with you. I loooove running.” Bah! A polar bear swim, that extra finger of Sailor Jerry (you know who you are), committing to a 6am 10k, writing a book, a fourth child. You know. Whatever. Last Friday, with my sister and her fiancé in town, we sat in the blue glow of the jacuzzi, ripe for making life-changing decisions. Out of the blue, my sister’s fiancé says “I want to get married. Like now.” And we laugh. Hahaha. Get married now? Haha. You’re hilarious. But… “Would it be that crazy?” I say and we swat at the idea for a little bit. The answer is yes. It would be crazy. 48 hours?! My kind of crazy. I was already planning a wedding in my head. You didn’t know I liked planning weddings, did you? It’s a little hobby I have. This was on Saturday. Wedding day would be Monday, before they left town on Tuesday. Muahahaha! What a thrill. Aaaaand 48 hours later, we were sipping champagne and giving cheesy, teary, impromptu speeches. Fondly admiring our masterpiece, shotgun wedding. Marriage license? Check. Marriage license in the morning, wedding in the afternoon. Livin on the edge is planning a wedding without even knowing it will be legal. That’s right. Rebels. Photographer? Check. My sister-in-law, Jody, is an amazing wedding photographer at Jody Lynn Photography and made everything look like it took months to plan. Make up artist? Check. Liz Eddy, longtime friend of said sister-in-law happened to be in town from her international work travels and was able to fit us in on short notice. Flowers? Check. My husband’s childhood friend, Marie, owns a florist (Flowers For You) and did amazing work! Venue? Check. Del Mar Beach is right around the corner. Not too shabby. Dress? Check. Before loading the crew to shop for a wedding dress, my other sister and I did a recon mission to a local store. We found this dress, and only this dress. My mother-in-law did a little day-of alteration for this stunning result. Boys shirts were bought at the same place. Nuptials? Check. Anna Allen, wrote and performed a beautiful ceremony, which explained my sister’s drive to get married on 08-08-2016. Infinity day. Add a little Hawaiian barbecue, a last minute cake from VG Donut and Bakery, some tiki torches, pool lights (sending a grateful nod to the hot tub for its ingenious creation) and Voila! It’s a wedding. It’s almost like it was meant to be. So this weekend, besides putting a wedding together in two days, I had a pretty big epiphany. Despite my grumbling, I actually like stress. Not in the actual liking way but in the deep down feed-off-the-chaos-adrenaline kind of way. This explains a lot. It explains procrastination, for one. I always thought I procrastinated because I was lazy. It explains why I get more done when someone is breathing down my neck to do it and why I tend to add to my plate when I am at my busiest. Bring it, I say subconsciously. All the while complaining. Categories: Uncategorized, Write Like A Ninja | Tags: beach wedding, del mar beach, elopement, eloping, how to write a novel, new writer, novel writing, procrastination, summer wedding, the art of writing, the joy of writing, wedding, wedding planning, work life balance, working mom, writer, writing, writing goals, writing techniques | Permalink. Insightful, poignant, and witty. I can’t wait for the next post! 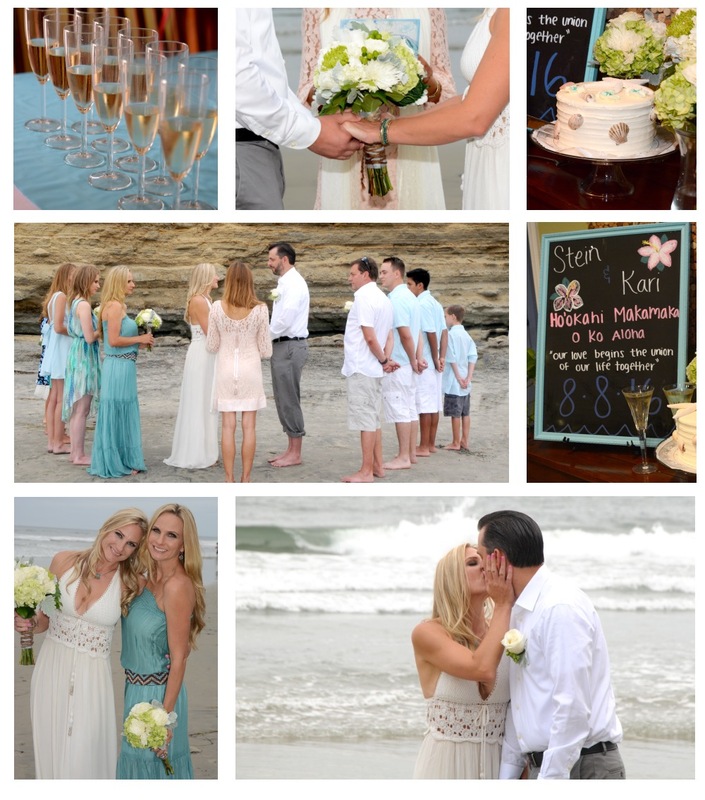 Sneak peek into a last minute Wedding I was apart of…. Photographer and family guest!